Time flies. 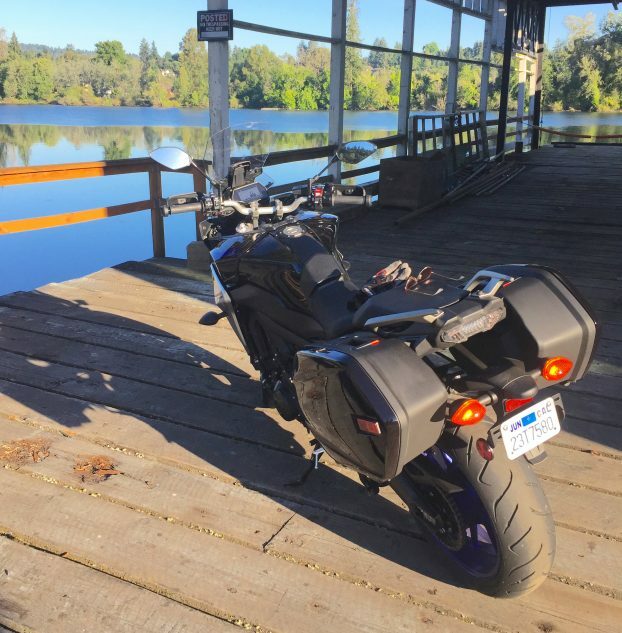 Has it really been six months since I picked this bike up in Portland, Oregon? I guess it has been, according to my original First Ride report. I think what happened is, since Yamaha is in the process of moving part of its operation to Atlanta, they must’ve forgotten we had it. That or we told them we wanted to keep it around to do a comparison with a Ducati 950 Multistrada, but we finally gave up trying to pry that bike loose from Ducati. I took delivery in Portland, Oregon, back in July. It would’ve been a good comparison. The Tracer and its 847cc Triple isn’t going to make quite as much power as the Ducati’s 937cc Testastretta V-twin, but it is going to be close enough for most people, and you’re not going to get the Italian bike for $12,999 including hard bags and a centerstand. 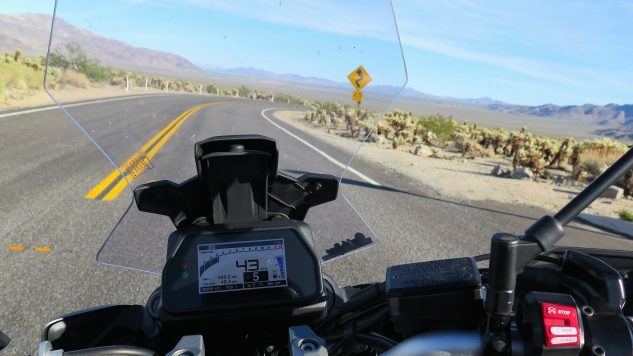 The other standard items that make the Tracer GT a viable lightweight sport-tourer include electronic cruise control, a rear shock with knob-adjustable rear preload and a 4.8-gallon gas tank that gives it plenty of range. 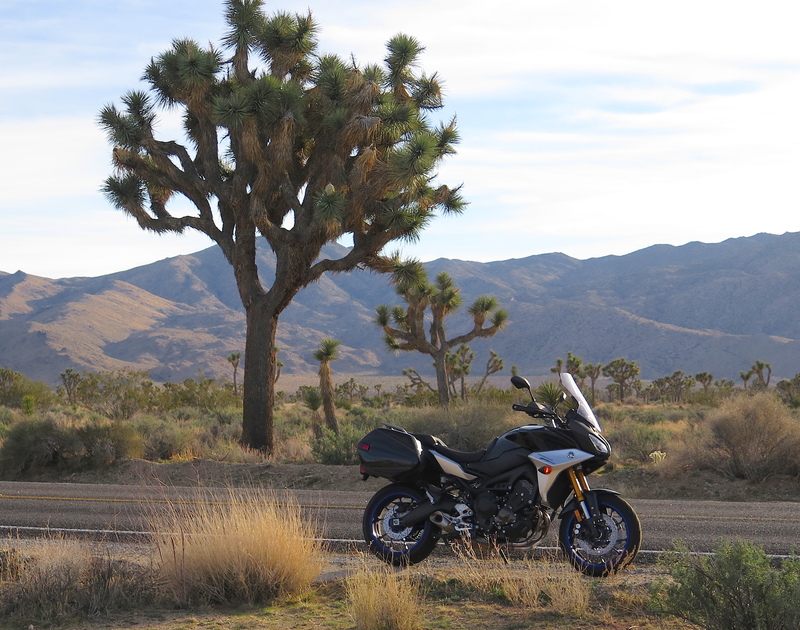 I regret to inform you, however, that in those six months I only put about 3000 miles on the thing (there were just too many other motorcycles to ride, dammit), and so stating the usual “during that time, I had no problems with the Tracer GT whatsoever,” really doesn’t mean much. But it’s true. Even the exhaust headers are still nice and shiny at six months. One benefit of living in a desert. Most of those 3000 miles were probably less than 10 miles at a time, so easy is the lightweight (for a sport-tourer) GT to roll out of the garage and hop onto. 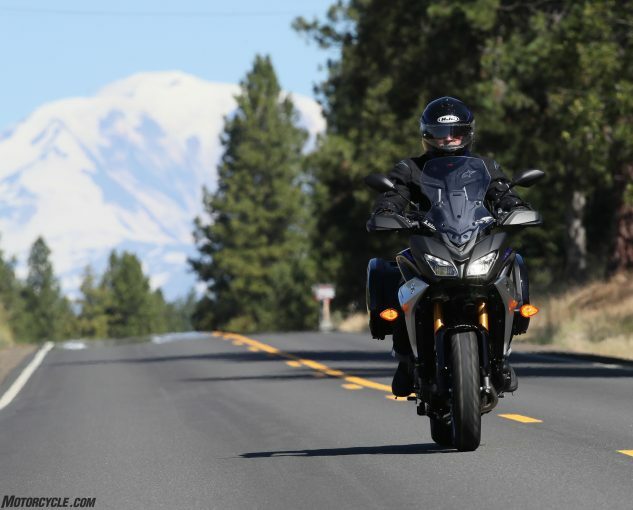 When there was a choice between a new Gold Wing or Indian Chieftain and the Tracer, the Tracer generally got the call. Later, when it was between a new Kawasaki Z900RS Cafe or CB1000R and the Tracer, it was also usually the Tracer. Maybe because having bags makes it so easy to schlep stuff? That, and the Tracer’s torquey, friendly nature and superb ergos for two; passengers dig the Tracer’s comfy, broad back seat, and its grab rails. Also, as the bike’s gearbox broke in a bit, the quickshifter (also standard) seemed to work better too – which made the Tracer effectively an automatic, for upshifts anyway. You think you don’t need stuff like that and then you get used to it. As winter set in here in Orange County, the Kid would often steal the Tracer for his 12-mile commute to work. Standard heated grips are a requirement for natives like him when temps plunge into the 50s. Maintenance-wise, in those six months I checked tire pressures three or four times. The standard Dunlop D222 Sportmaxes on my bike showed no unusual wear at all, and the rear had plenty of life left down the middle at 3700 miles. Rear tire life is another reason a lighter sport-tourer like this one makes all kinds of sense for everybody except people who enjoy buying tires. Not that I would know. Fuel mileage, too. 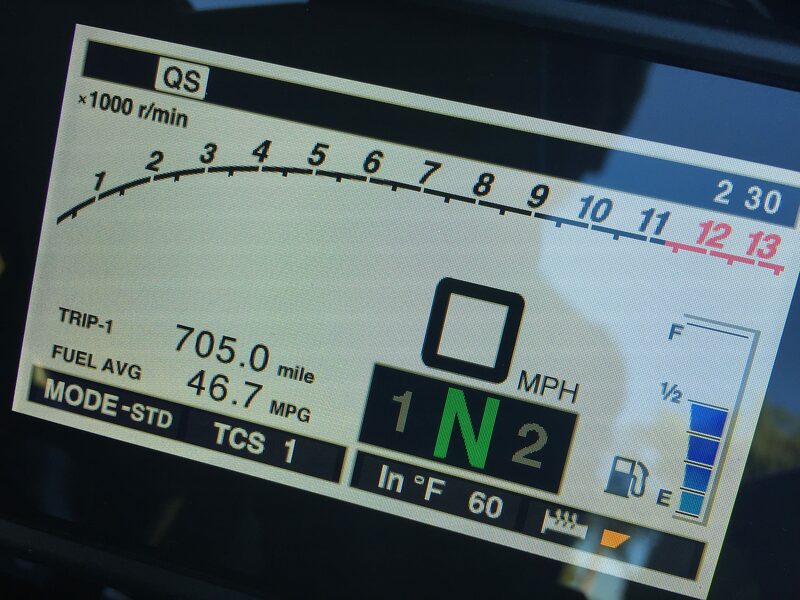 Riding the thing home from Portland at speeds between 80 and 90 mph for 1200 or so miles resulted in 45 mpg. In normal everyday use back here at the ranch, calculations say 46 mpg; the bike’s computer mostly agrees. 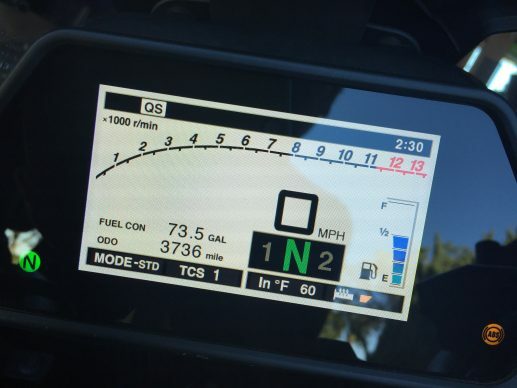 If the tank really does hold 4.8 gallons, you should be able to cover 220 miles before running dry. Gerrad the Yamaha tech had snugged up the drive chain in Portland 2800 miles ago. When I popped the bike up onto the centerstand to shoot a little WD-40 on the links about September-ish (I saw a few small rust spots), the slack still seemed about right so I didn’t mess with it. Engine oil was right in the middle of the sight glass, and still looking cleanish, every time I looked. 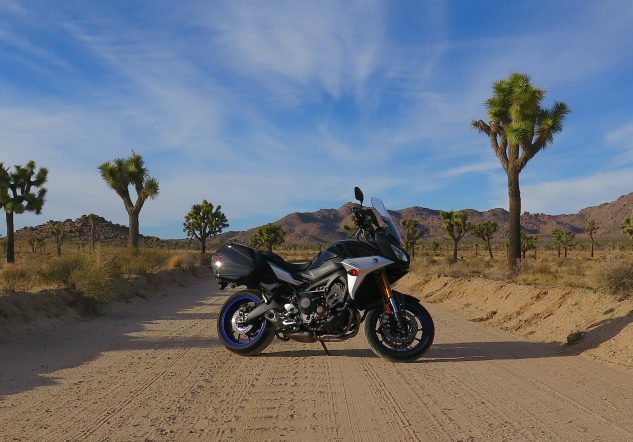 At the end of the day (or six months), the Tracer’s not the most exciting bike in the world or even in its class, but I won’t be surprised if it’s not the most reliable – and that three-cylinder engine actually is pretty exciting when you hold it open and use the quickshifter through a few gears. It’s so everyday useable, you forget how sporty and fast the thing is. You take it for granted. It took Yamaha a while to sort out the Triple’s fuelling, but now that it’s reached mature form on the Tracer, the result is a seamless, glitch-free riding experience, and I’d have been more than happy to ride it back to Portland. Instead, I threw it on back of the Ranger and dropped it off at Yamaha’s Cypress, California, HQ, shedding a little tear in the process. Great bike.